The hardest part of the while project was to cut a circle. Start by cutting the Minkey, get a string and make your own protractor, I folded the fabric in half and was able to cut the full circle. Once you have the Minkey cut, then use it as a template for the fleece, this way it will be sure to match up. 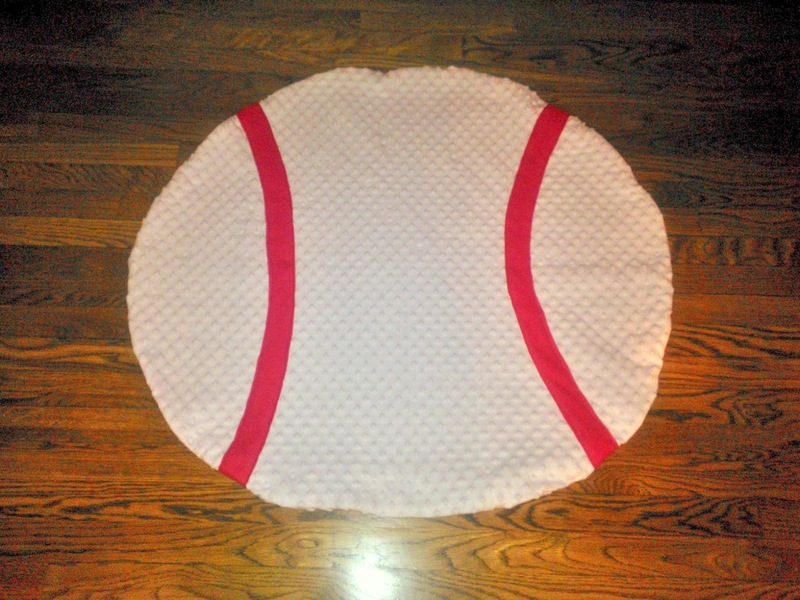 Once you have two circles, put them aside and work on your baseball stripes. I just cut a free had gentle curve in the extra fleece (that's why you need about a 1/4 yard more). Once you get one the way you like it, use it as a template to cut the other side. Lay out your stripes with both curves facing in. This part needs to be pinned to keep in place while you sew. After pinning lay it out on the floor to see if they line up, it may not be prefect but it still works! I used red thread to sew along both of the edges on either side of the strips. There not going anywhere now! Last step is now to line up both fronts, so the striped Minkey is facing in. Most fleece does not have a wrong or right side. Sew around the edges. Leave about a 3 in gap at the bottom so you can turn the fabric right side out. Once you turn the fabric inside out, had stitch up the last few inches and your done!